Welcome back to my adventure. Starting today, I intend to provide more details about my gear and trip preparation. Believe it or not, these posts help me organize my thinking about the climb. Nothing helps me more than to review my gear and climbing plan. 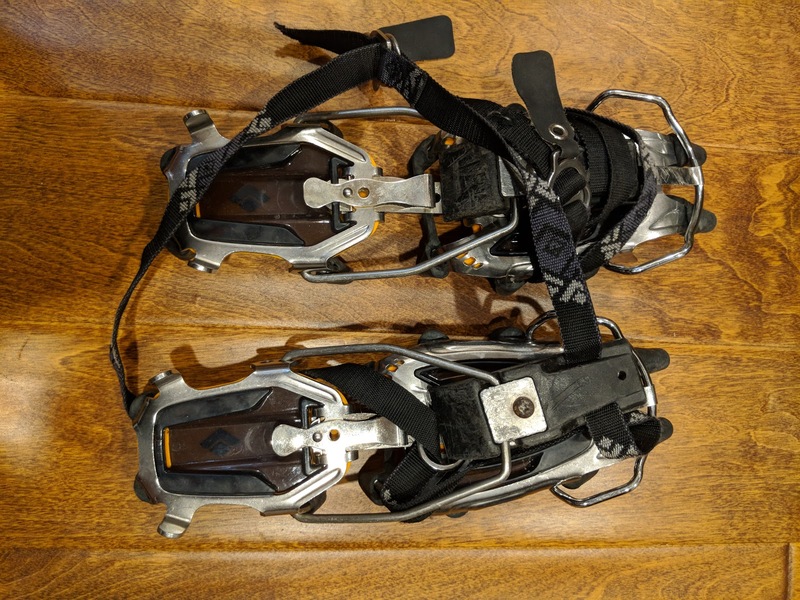 Over the next few weeks, I plan to cover both topics - first my gear - and to post about gear relevant to each of the major body parts starting with my feet and ending with my head. Along the trip up north through my body, you will learn about the gear I plan to take and when I plan to use it. Brendan (my climbing buddy) and I spent some time organizing a Google sheet with all our gear. Care to see the entire list? Well, here it is. We have many items on our list and some may end up staying home. Until we finalize the list, expect it to change routinely until we depart. Travel footwear from VA to Chinese Base Camp (CBC): My trusted flip-flops. 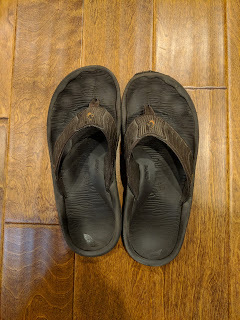 These OluKai sandals (and their ancestors before them) traveled the world with me. CBC to Interim Camp and perhaps Advanced Base Camp (ABC): Approach shoes. 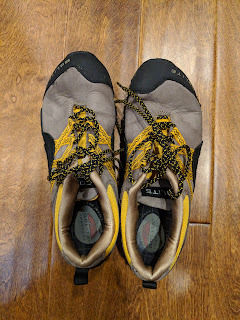 I intend to either use my GoLite approach shoes - the same I wore to the summit of Aconcagua - or a new pair of Addidas trail running shoes if they fit and I can break them in before I leave. Bad idea to break in new shoes on a big climb. Blisters just don't heal at 6000m (20,000 feet) and above. These GoLite approach shoes are comfortable but they have seen better days. I ran them through 3 or 4 washing machine cycles to finally rinse the dirt off. They might not be up for the journey. I might use these Addidas trail runners instead. No, I don't have them yet. They are en route from Moosejaw.com (don't ask). Advanced Base Camp and above: Mountaineering boots. 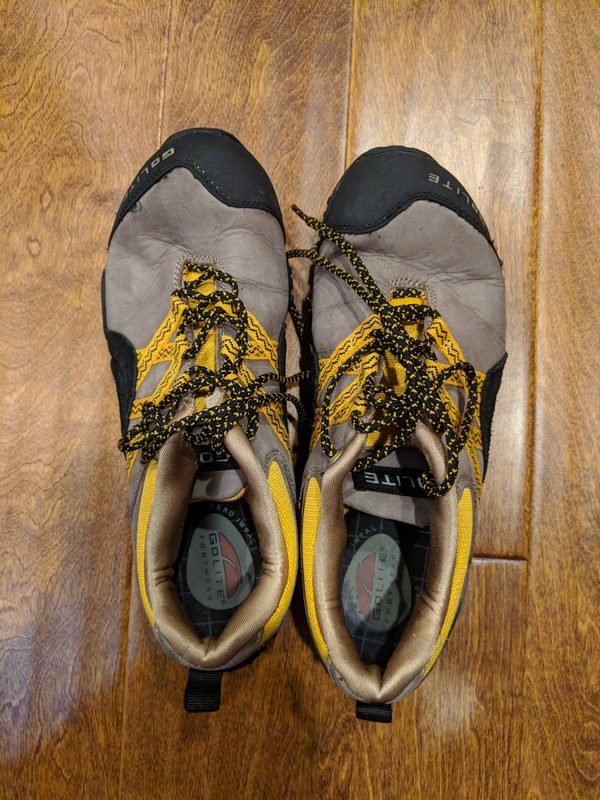 I have a nice pair of La Sportiva Olympus Mons. Right now, they are drying out from today's workout but I can give you a quick glimpse of the outer shells and liners - they both stink from sweat but I can spare a second to take a picture and then run them back into the gym where they can stink up that place and spare my office. 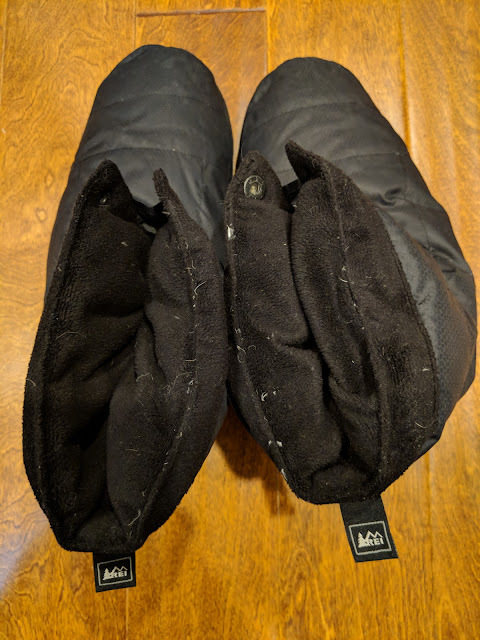 The outer boot is to the left and the liner is on the right. I intend to wear these for long stretches - not the outer boots unless I am climbing but the liners. Those liners are comfortable. I might even say they are as comfortable as bedroom slippers now. Against my skin: I wear socks of course. Well, actually, "of course" should not be taken for granted. I know several people who never wear socks - even when climbing on glaciers. They hate 'em. I don't mind socks if I must wear closed toe shoes. Here is an assortment of socks I plan to bring. I intend to bring several pairs of some and only one pair of others. 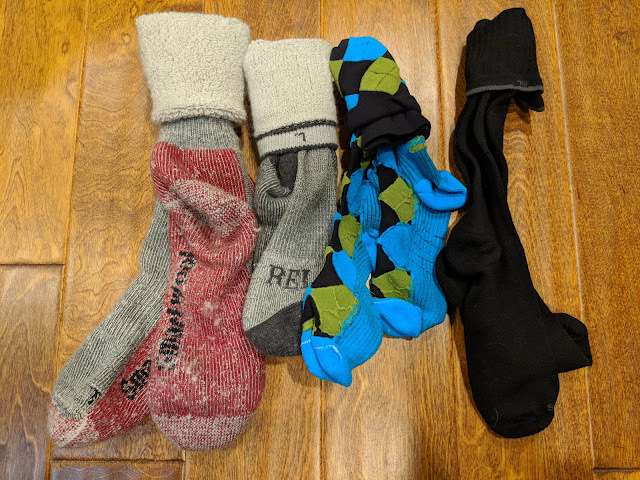 The leftmost pair of socks are my night time socks. I put these over my feet with a healthy dose of foot powder to dry out my feet. Nothing worse than trench foot when climbing. Big thick wool mountaineering socks with Gold Bond Maximum Strength foot power does the trick every night. The gray pair next to my mountaineering socks are my everyday climbing socks. REI makes a great mid-weight sock that holds up over years. I like these and they treat my feet well. Even better for my feet for long days are two pairs of socks on the right - my compression socks. The colorful pair are great but have probably seen better days. The black pair are relatively new and will serve me well on Everest. These compression socks help my feet by squeezing them all day. I do get blisters from them on occasion so I intend to wear my newfound love - the vapor barrier sock (aka plastic bags) on my feet between the skin and the sock. These bags inhibit blistering and also keep my feet from sweating too much. Well, at least that is the plan. So far, the bags just make my feet sweat buckets. The heel piece broke in my "old" pair so I have an improvised replacement and then I have a relatively new pair for both use and parts. Yeah, sure they look a little shaggy but these booties are warm. You cannot go wrong with down booties. REI makes a fine pair. I am sure there are other things that I omitted in this post. 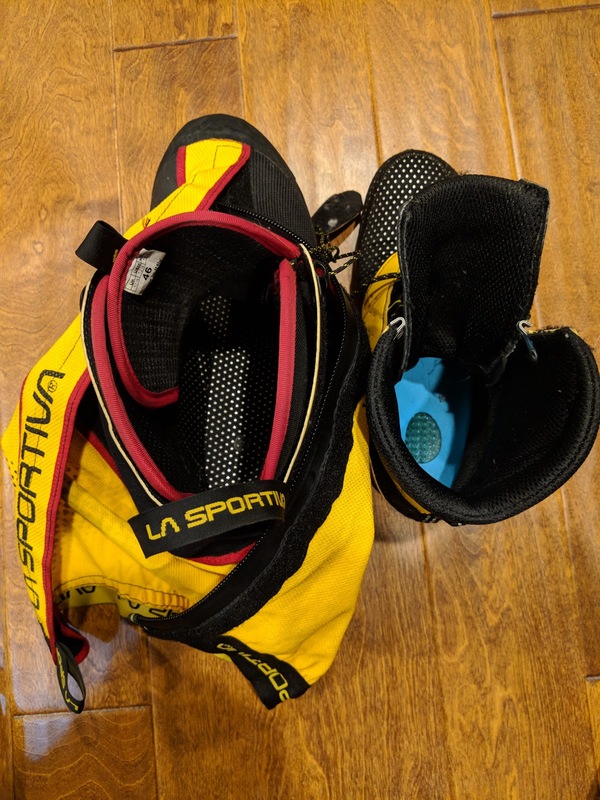 Sure, I have a ton of blister bandages and antibiotic creme that comes in handy but those things are not terribly unique to climbing Everest. So there you have it! My footwear gear collectively weighs about 4.5 kg or about 10 lbs. I do not plan to lug all that weight up to the summit. Some of these items remain at CBC while others accompany me for most of the climb (i.e., my mountaineering boots and socks). Thanks for following along. Next post...what I wear on my legs. Oooh, I know you can't wait. See you in a few days.